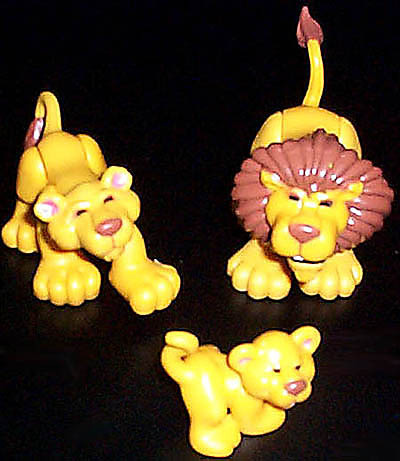 Below you will find a list of all animals sold in the Fisher-Price Animal Families series. The animals are listed in order alphabetically by animal name. Click here for a list of all known animal family sets in order by model number. Animal: Alligator (Father) Jointed Limbs: Jointed limbs, a jointed tail, and a jointed mouth that opens and closes. Description: Dark green father alligator with yellow eyes, He has a red tongue, and long white teeth. Animal: Alligator (Mother) Jointed Limbs: Jointed limbs, a jointed tail, and a jointed mouth that opens and closes. The baby alligator fits on her back. Description: Green mother alligator with yellow eyes. She has a red tongue, and long white teeth. Description: Green baby alligator with no movable parts. She fits on mother gorilla's back. Description: Black bird (toucan?) with a long orange beek, orange feet, and a white face and chest. Animal: Dolphin (Father) Jointed Limbs: Movable side fins, and a movable tail fin. He has a mouth that opens and closes with a pink tongue. Description: Grey father dolphin with a white belly. Animal: Dolphin (Mother) Jointed Limbs: Movable side fins, and a movable tail fin. Description: Grey mother dolphin with a white belly. Animal: Elephant (Father) Jointed Limbs: Jointed limbs and a jointed jaw that allows his mouth to be opened or closed. Animal: Elephant (Mother) Jointed Limbs: Jointed limbs. Description: Grey baby elephant with no movable joints, but with a trunk that can connect to parent's trunk or tail. Animal: Gorilla (Father) Jointed Limbs: He has jointed arms, and a jointed mouth that opens and closes. Description: Black father gorilla with a brown face, hands, and feet. Animal: Gorilla (Mother) Jointed Limbs: Her arms are jointed and the baby gorilla fits on her back. Description: Black mother gorilla with a brown face, hands, and feet. Description: Black baby gorilla with a brown face, hands, and feet. Baby does not have movable parts. She fits on mother gorilla's back. Animal: Lion (Father) Jointed Limbs: Jointed legs, and a jointed mouth that opens and closes. Description: Yellow father lion with a large brown mane around his face, a big triangular brown nose, and a tuff of brown hair on the end of his hail. Animal: Lion (Mother) Jointed Limbs: Her legs are jointed and the cub fits on her back. Description: Yellow mother lion with a brown triangular nose, round ears, and a brown tuff of hair on the tip of her tail. Description: Yellow baby lion (cub) with a brown triangular nose and round ears. Cub does not have movable parts. He fits on mother lion's back. Description: Brown monkey with a tan face, tan hands, and tan feet. Description: Black father penguin with a white belly, an orange beek, and orange feet. Description: Black mother penguin with a white belly, an orange beek, and orange feet. Description: Black baby penguin with a white belly, white cheeks, an orange beek, and orange feet. Description: Black baby penguin with a white belly, an orange beek, and orange feet. Animal: Polar Bear (Father) Jointed Limbs: Jointed limbs and a jointed jaw that allows his mouth to be opened or closed. Description: White father polar bear with a black nose and eyes. Animal: Polar Bear (Mother) Jointed Limbs: Jointed limbs, and a turnable head. Description: White mother polar bear with a black nose and pink inner ears. Description: White baby polar bear with pink inner ears, no movable joints. Description: Purple stegosaurus mom with aqua scales on her back, yellow spikes on her tail, white eyes, a red tongue, and white teeth. Description: Small purple baby stegosaurus with aqua scales on it's back, white eyes, and an open mouth with a red tongue. Baby has no movable parts. Animal: Tiger (Father) Jointed Limbs: He has jointed limbs, a jointed tail, and a jointed mouth that opens and closes. Description: Orange father tiger with black body stripes, and black and white stripes on his face. He has a pink tongue, and long white teeth. Animal: Tiger (Mother) Jointed Limbs: She has jointed limbs and a jointed tail. The baby tiger fits on her back. Description: Orange mother tiger with black body stripes and black and white facial stripes. Description: Orange baby tiger with black body stripes, black and white facial markings, and no movable parts. Fits on mother tiger's back. Description: Orange tyrannosaurus mom with blue scales on her back, blue finger and toe nails, white eyes, a red tongue, and white teeth. Description: Small orange baby tyrannosaurus with no movable parts.